People from all up and down the east coast travel to the Poconos for skiing trips each winter, but would you believe me if I told you the same was true for golf trips during the golf season? We partner with 12 fantastic courses in the Pocono region and have some very high class accommodations that our golfers enjoy year in, year out. 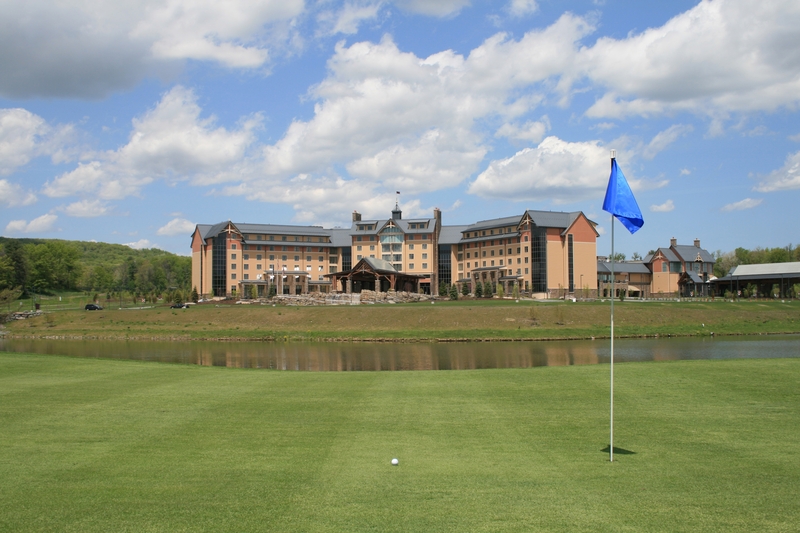 Beautiful scenery is at every turn as you explore the Pocono Mountains, which makes for amazing golf experiences. To top it off, you can also find great shopping, a hoppin’ casino, the famous Pocono Racetrack, great fishing, and nightlife that will assure you a fun filled-LEGENDARY time. If you know how we operate here at Genesis, you are able to give us feedback via the Genesis My Trip Review. And to be completely honest, courses in the Poconos had, on average, the most highly rated courses in our regions. The most highly rated and enjoyed being Jack Frost National. Jack Frost may not be the most difficult course we partner with, but overall it gives golfers of all skill levels an incredible game. A beautiful mountain course that truly clings to what a golf course should be. 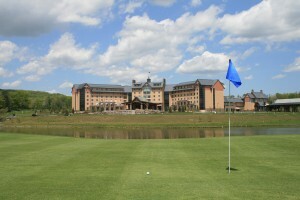 Many courses in the Pocono region take on the resort approach. Fernwood resort and Shawnee Golf course are two examples where “stay and play” is what it’s all about. The tracks at Fernwood are beautiful and there is so much to do on the resort, as well as staying in a top-class villa. Shawnee Golf Course is collectively on an island right in the middle of the Delaware River, which is such a rare treat, that you have to check this course out. Other courses of merit are Pocono Manor Golf Course, Skytop Golf Club and Split Rock Golf Course. All are amazing mountain region golf courses that prove worthy of LEGENDARY Genesis golf adventurers. One of the best parts about taking a trip to the Poconos is there is such variety in the activities you can partake in other than golf. Depending on when you take a trip, you could catch an awesome event at the Pocono Raceway, even a NASCAR race! Mount Airy Casino can be found in Mount Pocono, PA. Having over 65,000 square feet, this casino is loaded with slots and table games. It’s beautiful. It’s clean. And it’s ready for you to play! Looking for what the dining options are? Well, this blog post would be the length of a scroll. But to highlight a few, Barley Creek Brewing Company is one of the local favorites which also provides interesting tours to learn how their personal brewing techniques are completed. Fine dining on your radar? TREE Restaurant and Bar is the perfect example of “Farm to Table” and has a diverse menu that will satisfy your taste cravings. And lastly, be sure to check out Ehrhardt’s Waterfront Restaurant & Banquet Center, which is the most unique dining spot in the Lake Region. If you cannot tell by now, the Pocono Mountains has A LOT going on. And the only way you can experience it is if you get there! So we implore you to check this beautiful region out through Genesis. The crisp mountain air is a perfect complement to the incredible golf games you will play. Hit the casino in the evening after a delicious dinner. Or bring some fishing poles and fish the plentiful Delaware River. The choice is yours. How will you be a LEGEND? This entry was posted in Genesis News & Opinions, Golf and Gambling, Pocono Mountains, Pennsylvania, Uncategorized. Bookmark the permalink.